Do y'all have a favorite number? Or one that just sticks out to you all the time? 37 is Bob's. 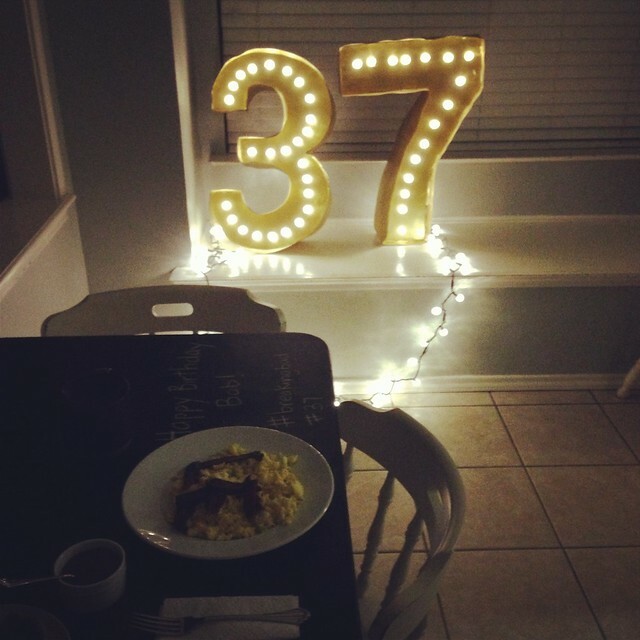 Ever since I have known him, I remember him saying 37 was his number and that when he turned 37, it would be his year. I have always known that 37 would be like Bob's 40. Or 50. (whatever the big year is for bdays.) I knew 37 had to be extra special. 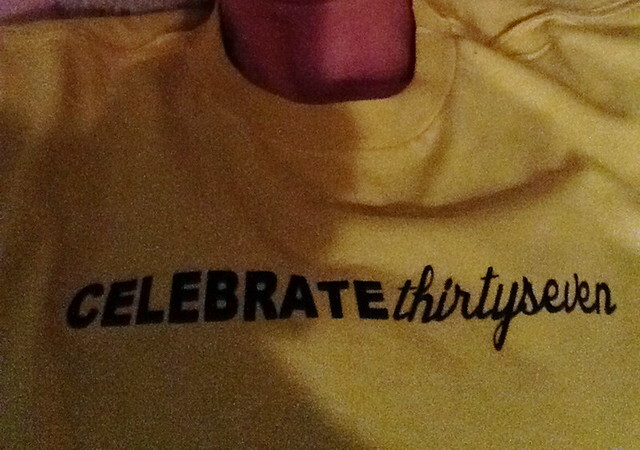 35 and 36 were so fun to celebrate so I was racking my brain to come up with something for the big 37. I started the day off with a special breakfast. If any of you are breaking bad fans then you will get the meaning behind the bacon shaped in 37. You can't have a big birthday without Marquee lights! I made them the same way I did the arrow here. I decided to focus on the "year of 37" for his gift. About a month ago, Bob and I went to a meeting at the hospital where they had a very talented friend of ours teach everyone some basic painting tips. She gave everyone a 12x12 canvas paper and taught us two different methods to painting. Bob combined a little of both and went at it. It was really a night full of giggles more than anything but somehow Bob's painting turned into something very meaningful to him. I don't think he intended on it happening but it was cool how it became such a special piece to him. He told me about the spiritual meaning behind each color and I thought it was awesome. I could tell he held back from telling others but I knew how much it meant to him. Especially since I got a glimpse of his phone and saw that he had taken a pic of his painting and set it as the home screen. Thats when my head starting spinning of great ideas for his 37th birthday. 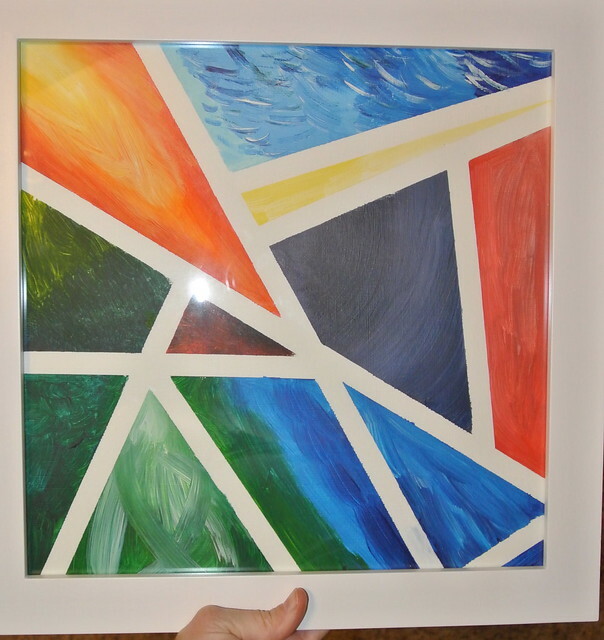 First I got his artwork framed. 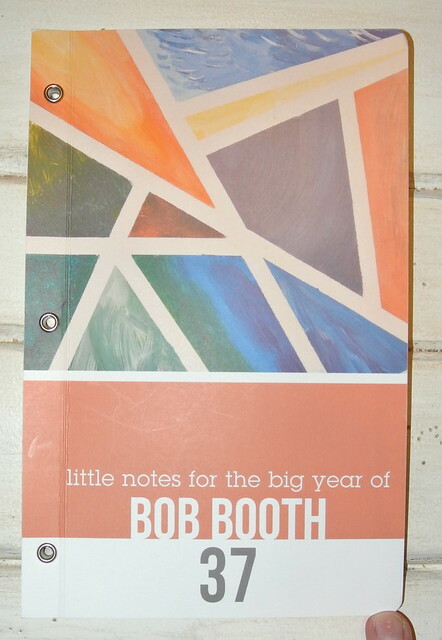 Then I made a journal on Minted and used his painting as the front cover. On the inside of the journal I wrote the lyrics to a song that he loves. Oceans, by Hillsong. It is a great song, you should totally go check it out. 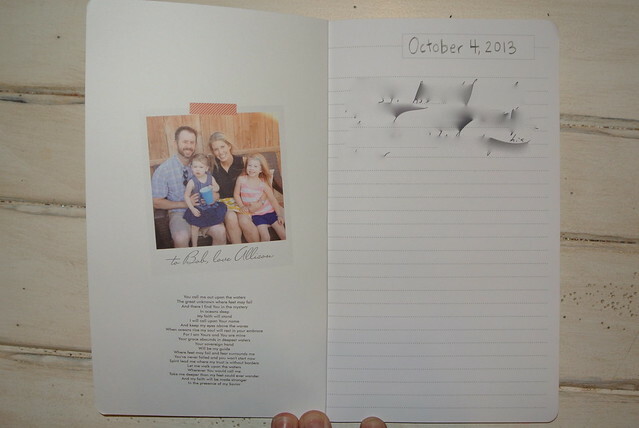 I wanted this journal to be how he documented his big year of 37. I filled 12 envelopes with all kinds of surprises that he will open each month during his 37th year. Each one is a little different but they all have some kind of verse, saying, note or quote for the month. I have written little notes in each one and tell him some things to reflect on and write about in his journal that month. I was so excited about this gift and had so much fun putting it all together. It is so so hard for me to keep my mouth shut though. I wanted to tell him what was inside every single one! Bob has so much better self control than I do so he has no problem at all with waiting till each month. I will do a post about each envelope as the months go by. Bob has been interested in starting crossfit for a while now. I know he held back and never did it because of cost, time and just not really having extra time to jump into it. I figured if I started him off during the first month with it, maybe it would become part of his normal schedule. 37 should be the year to become buff. 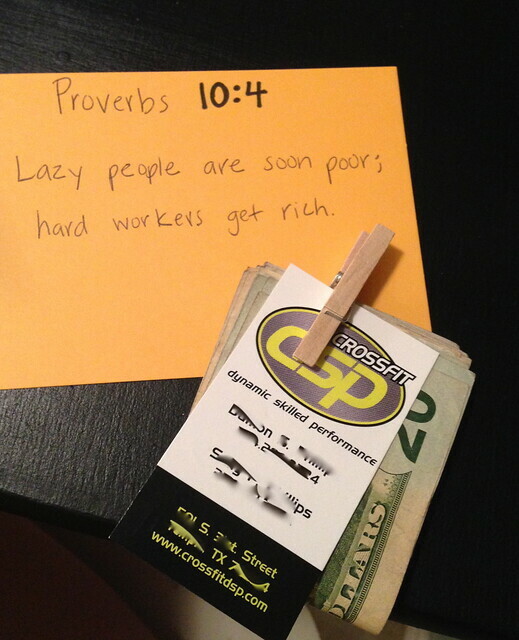 (I mean more buff) I picked Proverbs 10:4 because his birthday is October 4th. I thought the verse went along with a crossfit membership perfectly. The night of his birthday we went out to eat with some friends. 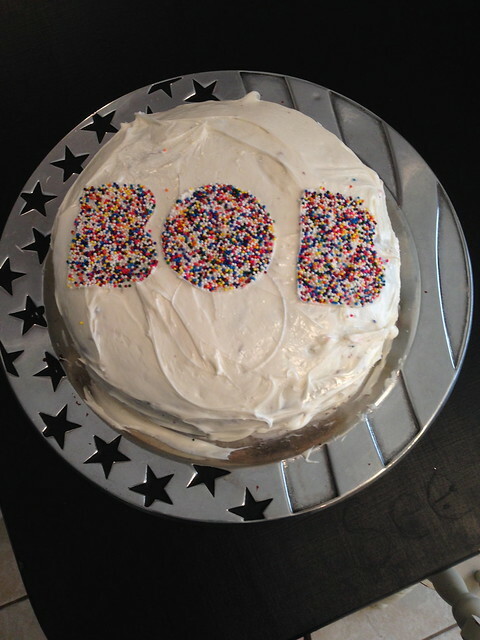 I made a cake to bring to the restaurant. I had seen the pinata cakes on pinterest and thought that could be fun. I had originally wanted to have 37 little trinkets or gifts inside but that was near impossible to come up with so I stuck with the candy. 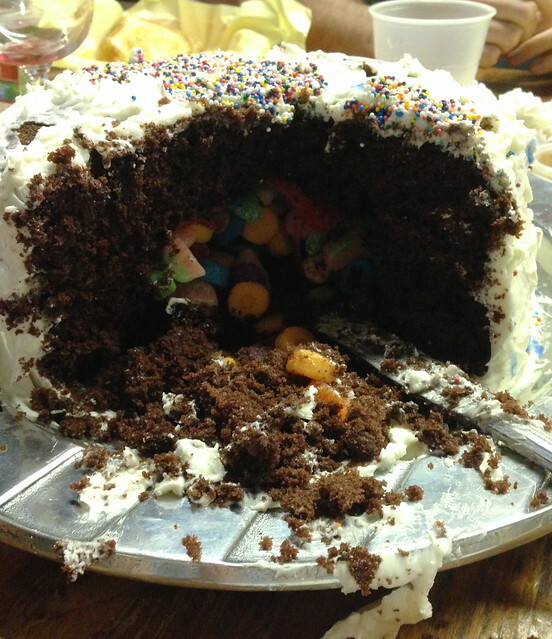 All the tutorials had m&m's coming out of the middle of the cakes. 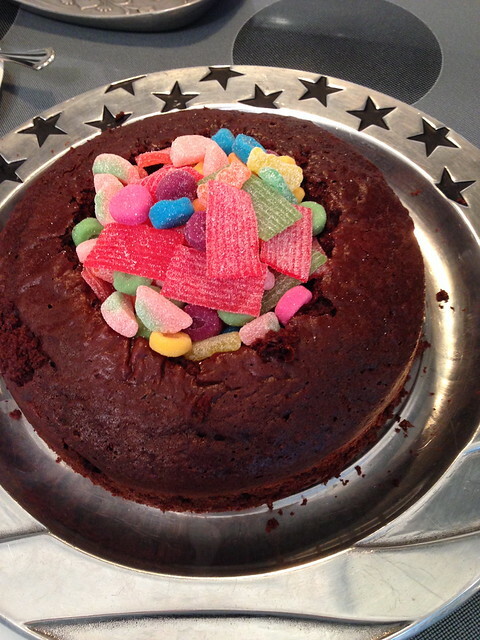 I decided to do all of Bob's favorite sour candies instead. 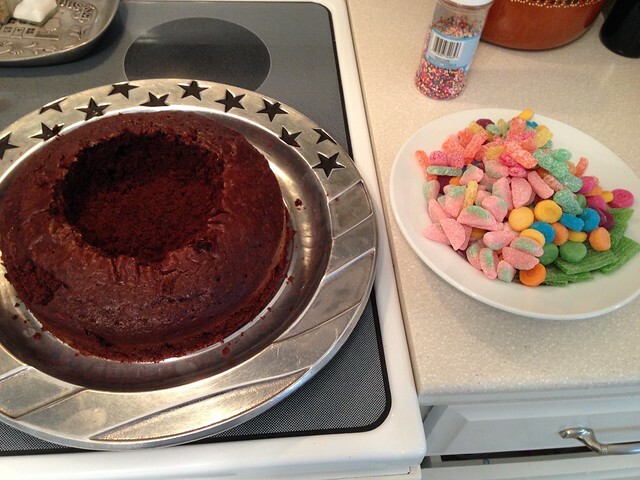 I baked two boxes of cake mix into two round pans. Hollowed out the bottom one and filled it up with candy. 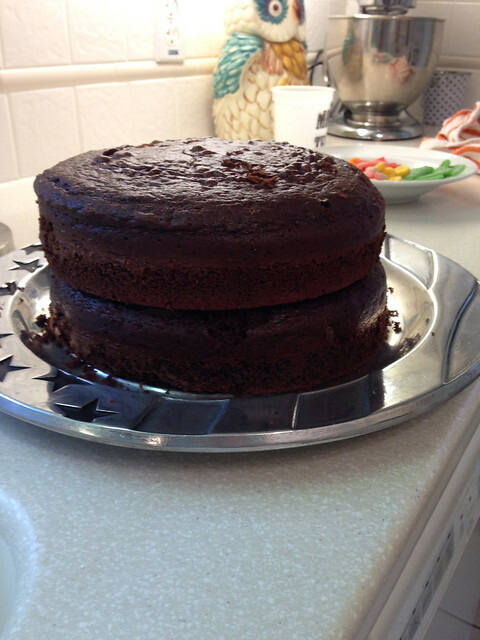 I took a little cake out of the bottom of top layer and then placed it on top. Then I iced it, laid some cookie cutters on top and poured sprinkles in them to make BOB and then put A LOT of candles on it. Turns out there is a reason you should do m&m's. Chocolate candy covered in chocolate cake tastes WAY better than sour gummy candy. Duh. I don't know what I was thinking. When I cut it open, the candy didn't spill out like in the tutorials. That's because all my candy just stuck together. It was kind of a fail but the kids didn't seem to mind. At least now I know. Happy Birthday to the man that lights up my world. 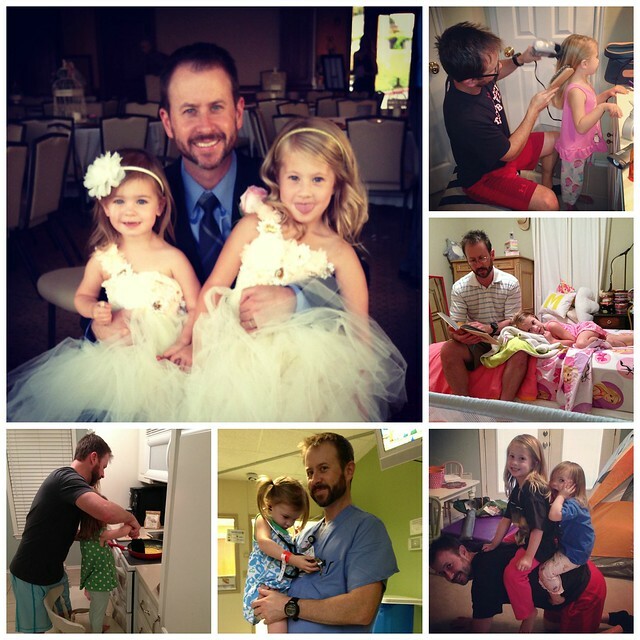 To the dad that blow dries his daughter's hair, reads a bible story to them every night, teaches them how to cook, makes sure they are well, and is a constant source of fun and laughter. We love you Bob! It was a great birthday and I can't wait to see what God has in store for my Bob this year! Just Amazing!!!! Such thoughful, fun, love-filled gestures and ideas! !You're amazing Allison! Happy Birthday Bob!!!!!! 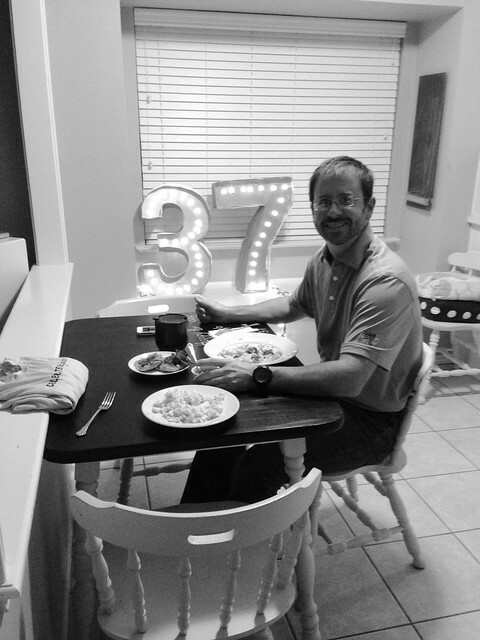 37 WOOHOO!! Allison!!!! You blow.me.away. HOW SWEET!!!! That journal is the most thoughtful awesome gift I've seen. :) You 2 are precious. Cheers to 37 & many many more. 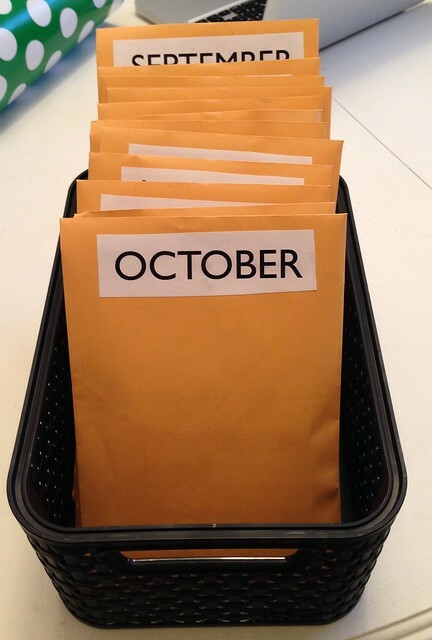 I look forward to your posts about the envelopes each month. ps this is misty lol I am signed in under melanie's blog and don't know how to change it without deleting all of this. You never cease to amaze me with your thoughtfulness and creativity. 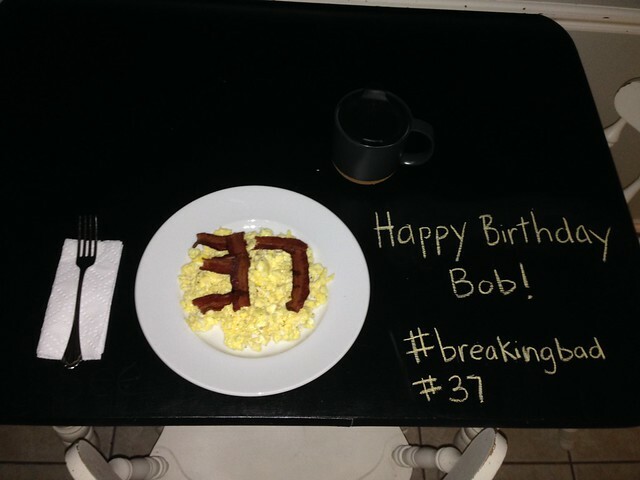 Happy birthday bob! 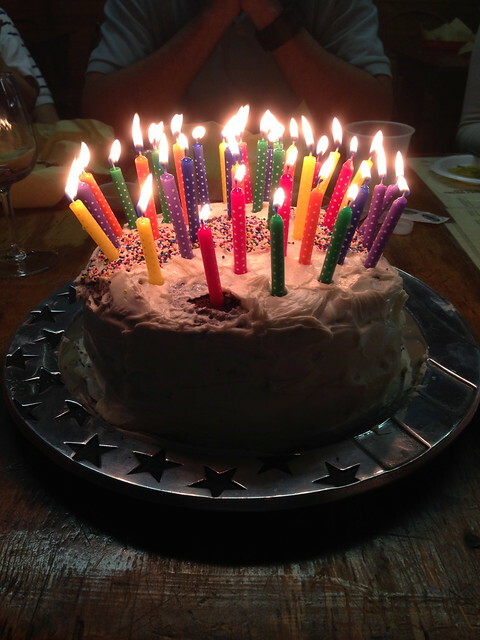 Hooray for 37! Love y'all to pieces. So neat! You are such a kind and loving person! You think of little ways to make people feel VERY SPECIAL! This is a wonderful way to celebrate such a great husband and dad. You are the most loving, caring wife and mom and I am so proud of you my sweet daughter! !